The Canada lynx is protected under the Endangered Species Act, which makes encountering one in the wild an extremely unusual occurrence, especially here in Colorado. The lynx by nature, tends to be a reclusive and shy animal, rarely venturing into populated areas. According to Colorado Species Conservation Manager Eric Odell, the current population is estimated to be between 150 and 250 lynx throughout the state of Colorado. Currently, the majority of lynx reside in the San Juan Mountains in the southwestern part of our state, though there have been occasional sightings reported in other high-elevation areas such as: Copper, Vail Pass, Redcliff and Leadville. Keeping track of lynx has presented some unique challenges since the state discontinued its use of radio collars to monitor migration patterns in 2010. Most current information regarding the species relies solely on hiking trail cameras or eyewitness accounts by local residents or federal government employees. How are lynx doing in our state? In 1999, reintroduction of 218 wild-caught Canada lynx began the great comeback for this elusive predator in our state. With an estimated population of 150 to 250 after two decades, any wildlife conservationist would consider this project a huge success. Odell assures the residents of Colorado that they “… are monitoring occupancy and it has remained relatively stable over the past four years, so [they] believe that the population is stable as well.” Cal Orlowski, Mountain Sports Ranger for the White River National Forest, agrees that the population seems stable, and is close to the carrying capacity for the habitat we have here. After all, lynx don’t have many predators in Eagle County – other than people and the development of national forest. When it comes to Eagle County’s local lynx families and the effects of our consistent development of wildlife areas, conservation gets tricky. 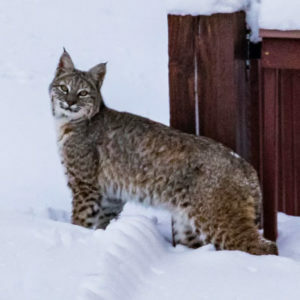 In the past two years, there have been two reported lynx mortalities west of Vail Pass between mile markers 187 and 188, which the Eagle County Safe Passages for Wildlife group has identified as a primary habitat connection split down the middle by I-70. Many local residents in Eagle County agree with the need for a wildlife migration bridge in this area like those in other mountain states. These bridges could prevent many wildlife fatalities and create safe migration paths for animals crossing these habitat barriers. Lynx face many obstacles in the daily quest to survive, from habitat destruction to climate change. Despite the odds being stacked against them, this species continues to survive in the forests and mountains of Colorado. If you do get the rare honor of spotting a lynx, treasure it, because it might be the last time you see this phantom of the forest in its natural habitat. Allie Feldmeir is a STEM Instructor at Walking Mountains Science Center in Avon. Allie has never seen a lynx in the wild, but she plans to keep on looking!